In 2001, I discovered what I believe to be Rancholabrean rubbing rocks on California’s North Coast (Parkman 2002a, 2002b, 2002c). (1) These are features that I believe were used for grooming by now-extinct Ice Age megafauna such as Mammuthus columbi and Bison antiquus. The rocks are located on the coast of Sonoma County about 75 km north of San Francisco, within Sonoma Coast State Beach, a unit of the California State Park System. To date, I have located six sites consisting of one or more rubbing rocks, all within an area about 4 km in diameter. The two main sites are referred to as Mammoth Rocks and Jasper Rock. The Mammoth Rocks site consists of four loci of rubbing rocks, separated by about 300 m (Fig. 1). Two of the loci consist of very large blueschist seastacks (20 and 30 m tall). The other two loci are smaller blueschist boulders (4 and 5 m tall). The four loci surround an enigmatic wetland that I believe may represent a relic animal wallow. Jasper Rock is located 3 km south of Mammoth Rocks. This site consists of a single jasper (red chert) boulder which stands about 2.5 m tall. A shellmidden (CA-SON-365/H) is located 100 m south of the boulder. Over the past two years, I have developed what I term, “The Rancholabrean Hypothesis.” Simply put, the hypothesis proposes that elements of the Rancholabrean landscape (e.g., megamamal rubbing rocks and wallows) still survive and can be detected on the contemporary landscape. Furthermore, by identifying these Pleistocene features, it may be possible to map the archaeological presence of the area’s first people. Since the initial discovery of the Sonoma Coast rubbing rocks, a loose-knit team of researchers (including archaeologists, geologists, paleontologists, geomorphologists, pedologists, physicists, chemists, zoologists, botanists, and molecular biologists) have been working with me to confirm or deny the Rancholabrean Hypothesis. (2) The following is an update on some of the progress that we have made to date as well as our plans for future research. Since 2003, archaeological excavations have been underway at Jasper Rock, a highly-polished jasper outcrop with evidence of past quarrying. The spring and fall 2003, and spring 2004 archaeological field classes from Santa Rosa Junior College, under the direction of Thomas Origer, and a summer 2003 volunteer crew under my direction, have to date excavated approximately 30 cubic m of the site. In spring 2003, six 1x1 m units were excavated near the jasper outcrop. During the summer and fall of 2003, one of the units was expanded into a 4x4 m block exposure (Fig. 2). The spring 2004 crew worked on the 4x4 m exposure, and also excavated three 1x1 m units at CA-SON-365/H, a shellmidden located 100 m south of the jasper outcrop. The surface of the shellmidden had revealed debitage of a material similar to the outcrop. Thus, we chose to excavate the shellmidden in order to determine its connection, if any, with Jasper Rock. By the end of fall 2003, a single 1x1 m unit located within the larger 4x4 m exposure at Jasper Rock had been excavated to a depth of 280 cm. Additionally, an auger test within the deep unit had been excavated to a depth of 403 cm. As we excavated down, we discovered that the rock outcrop is polished to a depth of 2 m below the current ground surface. The excavations also revealed that the site served as a quarry for stone tool material, and that it was probably utilized at multiple times in prehistory. The topsoil (a dark brown Rohnerville Loam from 0-90 cm) contains numerous hammerstones, chert and obsidian debitage, and several obsidian projectile points (Fig. 3A, B). The projectile points and obsidian hydration indicate a date of about 500CALYBP for the upper component (0-90 cm). Fig. 3: Selected Artifacts from the southern North Coast Ranges. Jasper Rock: A, midsection of an obsidian serrated projectile point; B, obsidian corner-notched serrated projectile point; C, chert burin-like end scraper with blade scars on dorsal surface; D, chert backed bladelet; E, quartz blade-like flake (? ); F, quartz blade-like flake (? ); G, chert backed bladelet; H, obsidian backed bladelet; I, chert backed bladelet. CA-SON-1719: J, chert blade-like flake; K, chert blade-like flake; O, chert side scraper; P, obsidian burin spall (?). SCSB-03-2: L, quartz thumbnail scraper; M, chalcedony side scraper (has polish on edge at bottom of image). SCSB-03-7: N, chalcedony end scraper. CA-NAP-58: Q, obsidian microblade; R, obsidian microblade; S, obsidian microblade, 35 mm long. “Lakeside Park” site (Clear Lake): T, fourteen obsidian blades and microblades. An additional component (or perhaps components) exists from about 100-180 cm, a zone characterized by compacted yellow loam subsoil. Hammerstones and debitage also occur here, as do much larger (25-100 kg) detached blocks of the jasper outcrop (Fig. 2). The large blocks appear to have been dislodged from the overhanging outcrop, perhaps to facilitate quarrying activities. (3) I suspect that some of these blocks were removed from the parent outcrop by way of prying. Several backed bladelets of chert (Fig. 3C, D, I) and one of obsidian (Fig. 3H) came from this component as did an end scraper with apparent blade scars on its dorsal surface (Fig. 3C) and several small thumbnail scrapers. The bladelets resemble those recovered from the lower two components of the Duncans Landing Rockshelter (CA-SON-348/H), an important archaeological site located 1.4 km south of Jasper Rock (Schwaderer 1992). The Duncans Landing Rockshelter contains at least five cultural components, the next to the lowest (Component 2) dating to 9,000 CALYBP (Component 1 has yet to be dated). (4) It is possible (but certainly not proven) that the cultural component (or components) found between 100-180 cm at Jasper Rock is contemporaneous with the early Holocene occupations at nearby Duncans Landing Rockshelter. At Jasper Rock, additional cultural components may exist from 180-350 cm. The single deep excavation unit revealed quarry debris to 220 cm, and several possible hammerstone spalls were found at 200-220 cm. The auger test made in the same unit recovered what may prove to be small pieces of quarry shatter to 340-350 cm. Additionally, two small blade-like flakes of quartz were found at 200-210 and 310-320 cm, but will likely prove to be percussive shatter or perhaps even geofacts (Fig. 3E, F). (5) Because the deep unit was sited directly beneath a heavily-polished knob of the outcrop, care must be taken to segregate possible geofacts and zoofacts from artifacts. To this end, Glen Halverson, one of Tom Origer’s students and my volunteer, created a mechanical trampling experiment to replicate the effects of megamamal trampling on local chert cobbles. The results of that experiment are currently being analyzed. However, some of the mechanically-produced “zoofacts” appear to closely resemble cultural debitage. Similar findings were made at the Big Eddy site in Missouri, where lithics thought to be pre-Clovis in origin, are now thought to be zoofacts (Lopinot et al. 2000). At Jasper Rock, however, we appear to have cultural material to a depth of at least 220 cm. If the Coastal Migration Model (Dixon 1999; Fladmark 1979) has merit, as California’s linguistic diversity and recent archaeological discoveries on the state’s South and Central Coasts (e.g., Johnson and Morris 2002; Jones et al. 2002; Rick et al. 2001) suggest, the Sonoma Coast should have offered abundant resources for early Paleoindians in the late Pleistocene. At that time, the Mammoth Rocks and Jasper Rock sites sat at the back of a broad coastal plain, most of which is now inundated. (6) The plain was likely endowed with a rich growth of perennial grasses resulting from the complex grazing-browsing-trampling regime of the Rancholabrean megafauna (Edwards 1991:4). This coastal prairie comprised the northern part of what I term the Farallon Plain (Parkman 2003b). It extended from the mouth of the California River (Howard 1979:74) west of the Golden Gate to a point north of the Russian River’s mouth. Ranging from approximately 20-48 km in width, the prairie may have surpassed 300,000 ha in size. Further inland, an approximately 200,000-ha grassland (or grassland savanna) extended from the California River north to Cloverdale, including the Petaluma and Sonoma Valleys and the Santa Rosa Plain. A number of obvious east-west corridors linked these interior and coastal “pastures,” allowing for the easy anastrophic migration movements of herds of megaherbivores (cf. Jefferson 1988; Jefferson and Goldin 1989). (8) The Mammoth Rocks site sits adjacent to one such corridor, the lower Russian River Valley. Another corridor was probably the area comprised of the Estero Americano, Estero San Antonio, San Antonio Creek, Americano Creek, and Stemple Creek drainage systems linking Novato and Petaluma with Bodega Bay. Further south, another corridor most likely followed the Crystal Springs Reservoir (San Andreas Fault) linking Palo Alto with San Francisco’s Lake Merced area. Naturally, the most obvious corridor connecting the Franciscan Valley with the Farallon Plain followed the south side of the California River through the Golden Gate. During the late Pleistocene, this corridor passed through what I term the “Alcatraz Triangle,” an area located just inside the Golden Gate and bounded by the Golden Gate, Angel Island, and Alcatraz Island. One area of interest within the Triangle is revealed by bathymetric data. Near the Triangle’s center are found three rock pinnacles known as Harding, Shag, and Arch Rocks. (9) All three are currently hidden beneath the waters of San Francisco Bay. However, during the late Pleistocene, all three rocks were exposed. Harding Rock, the largest of the three, stood over 100 m in height. (10) This trio of rocks commanded an area where the trail corridor narrowed down as it approached the Golden Gate. Such an area would have provided ideal cover for Ice Age predators (especially Smilodon californicus, Panthera leo, and Arctous simus) intent on ambushing passing prey animals. (11) It is likely that Paleoindians made use of the area as well. (12) Indeed, providing the Coastal Migration Theory holds true, the corridor leading through the Alcatraz Triangle connecting the coastal plain with the interior could have provided the first settlers with an advantageous route for colonizing California’s Central Valley (Surovell 2003:589). It would have also allowed easy access to the coastal plain by interior Paleoindian populations (e.g., Clovis) moving west from the Central Valley. Mammoth Rocks also appears to have been located along a major migration corridor. It is likely that the rubbing rocks sat beside a major game trail linking the interior Santa Rosa Plain with the coastal plain by way of a pass leading up from the Russian River and passing between Red and Peaked Hills. The pass is still used today by State Highway 1. After coming up from the Russian River by way of the pass, late Pleistocene animal herds would have looked out across an approximately 20-km wide coastal prairie (at ca. 19,000-15,000 CALYBP), with the large exposed seastacks of Mammoth Rocks sitting directly in front of them. The coastal plain would have been marked by freshwater ponds and estuaries, meandering tree-lined drainages, localized sand dunes, and other exposed seastacks. The seastacks offered protection to herd animals, especially on windy landscapes like the Sonoma Coast.The Jasper Rock site, like Mammoth Rocks, is situated at the interior edge of the late Pleistocene coastal prairie. Their location at the back of the prairie, and along the ecotone separating the prairie and coastal range, almost guarantees that both rubbing rock sites were on a major trail corridor that led north and south along the interior edge of the coastal plain. The use of this north-south corridor by the megafauna would have allowed for easier movement and quicker access to choice locations on the prairie. The Duncans Landing Rockshelter (CA-SON-348/H) sat near this same hypothetical north-south trail during the late Pleistocene. For the past two years, I have been surveying the eroding bluff of the coastal terrace between Mammoth Rocks and the Duncans Landing Rockshelter. This has allowed me to regularly inspect the subsurface stratigraphy of a 5-km transect traversing the same area that I propose to have once been characterized by a major north-south game trail. Not surprising, I have found a number of archaeological sites along this transect.One of the often voiced concerns with the Coastal Migration Theory, and with the Paleoindian occupation of the late Pleistocene coastline, is that the archaeological sites associated with such use were inundated by the rising ocean at the close of the last Ice Age, and thus little can be found of them. I believe that is only partly true. If Paleoindians populated the Sonoma Coast, it seems likely that they would have made great use of the interior edge of the coastal plain. To date, I have located at least three archaeological sites along the survey transect where artifacts eroding from the coastal bluffs (from the subsoil at depths of 50-150 cm) appear to suggest a considerable antiquity (> middle Holocene?). Included among the artifacts are a few blade-like flakes with edge wear (Fig. 3J, K), thumbnail scrapers (Fig. 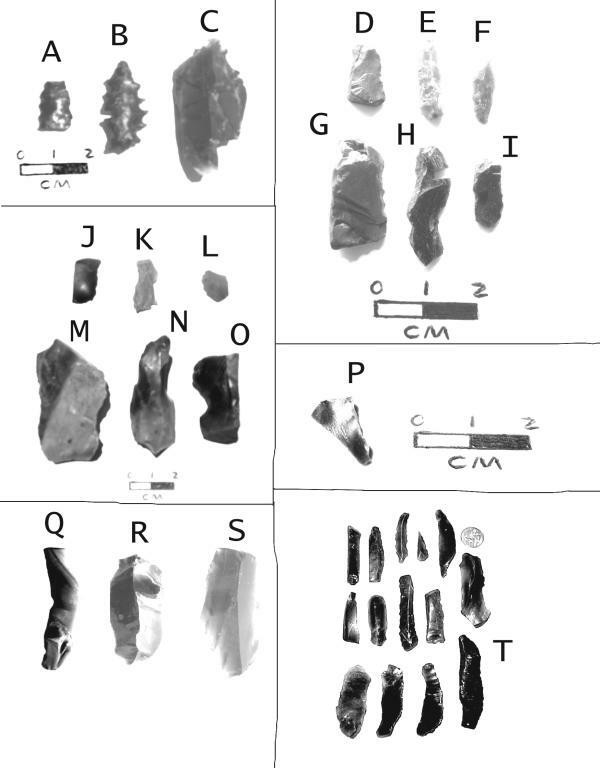 3L), and scraping tools manufactured from what appear to be exotic cherts and chalcedonies (SEM analysis suggests that one scraper was used to work hides or leather) (Fig. 3M, N, O), and an apparent burin spall from what may prove to be a locally-exotic obsidian (Fig. 3P). While none of the sites may actually prove to be associated with the earliest coastal occupations, they do suggest that the coastal prairie/coastal range ecotone was utilized extensively in the past. Equally important, the sites illustrate the buried nature of the local archaeological record, leaving us to wonder what Paleoindian evidence might eventually be discovered there. A Clovis-style fluted point was recovered at the interior edge of the coastal plain on the Mendocino Coast near Caspar (Simons et al. 1985). A second Clovis-style fluted point was found in a similar context on the Santa Barbara Coast (Erlandson et al. 1987). Closer to home, several chipped stone crescents, thought to be associated with fluted points, have been recovered from this same ecotone on the Sonoma Coast (from sites at Bodega Head, Stillwater Cove, and Salt Point). Although scant evidence, these artifacts suggest that Paleoindians utilized the interior edge of the coastal plain. Because today’s narrow coastal terrace is all that remains of the broader coastal plain of the late Pleistocene, it is one of the best places to search for Paleoindian evidence. During summer 2003, I worked with a team of researchers at Sonoma State University to analyze samples of the polished rock using both a Scanning Electron Microscope (SEM) and an Atomic Force Microscope (AFM). Dr. Stephen Norwick of the Dept. of Environmental Studies and Planning, Dr. Rolfe Erickson of the Dept. of Geology, and Tim McKernan, a student in the Dept. of Physics, participated in this research. The results of our investigation suggest that the polished rocks at both Mammoth Rocks and Jasper Rock were indeed created by Rancholabrean megafauna (Parkman et al. n.d.). The AFM mapping of the polish topography revealed traits not found in naturally-polished specimens (i.e., those created by the actions of wind, water, and faulting). 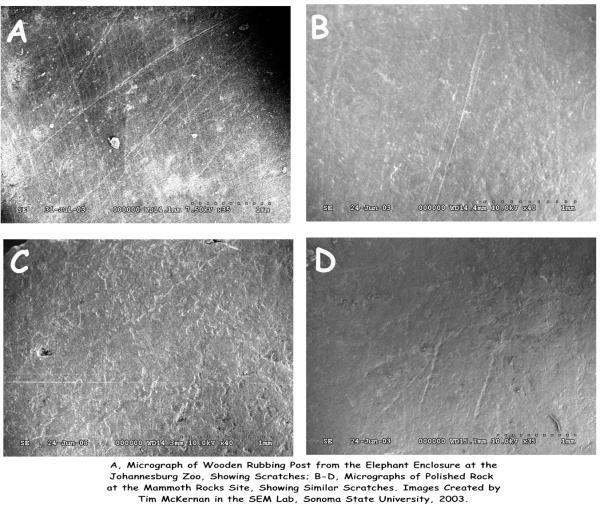 The SEM analysis identified striking similarities with historic elephant rubbing posts such as grit-induced scratches (Fig. 4). In 2002-2003, I investigated the prospects for recovering ancient DNA from microfissures within the polished rock. I found a team of molecular biologists to initiate the required in-depth research, but they were unable to follow through with the project. Unfortunately, to date no other work has been attempted in this regard. However, the DNA team did determine that the polished rock surfaces contain microfissures, some of which have been sealed. I feel less certain now that DNA was preserved in the sealed fissures, but this still warrants further attention. Until recently, the microblades from the Duncans Landing Rockshelter appeared to represent an anomalous situation in the local archaeological record. Finding additional bladelets at Jasper Rock suggests the presence of a microblade technology. I have since detected microblades elsewhere in the local North Coast Ranges. However, much more work is necessary to confirm or deny my observations. If a microblade technology does exist in the area, it has been all but overlooked by archaeologists. That said, there are a number of archaeologists who have noted finding isolated blade-like flakes, microblades, and microblade cores without going so far as to propose a local microblade tradition (e.g., Beard 1979:75; Heizer 1953:264, 341; Miller 1988:22-23; Sampson 1983:129). Actually, there appear to be two separate microblade technologies occurring in the North Coast Ranges. The first is found in the early Holocene as evidenced at the Duncans Landing Rockshelter and perhaps Jasper Rock, depending on that site’s as yet unknown chronology. These are backed bladelets of obsidian and chert with edge wear suggesting scraping and cutting actions. They do not appear to have been made for fitting into slots in bone tools. Additionally, a private artifact collection (known as the John Walters Memorial Collection) now in California State Parks ownership contains a number of obsidian blades (>50 mm long) and microblades (<50 mm long) ranging from about 30-100 mm in length (Fig. 3T) (Parkman 2003c). The objects were collected from a currently inundated shoreline site (“Lakeside Park”) on Clear Lake during the 1977 drought. (17) In addition to the blades, other, as yet unexamined, lithic materials were collected from this same site. The site is located just 4 km from the well known Borax Lake site (CA-LAK-36), at which were found Clovis-like fluted points and chipped crescents (Harrington 1948; Meighan and Haynes 1970). These Clear Lake blades could conceivably be Paleoindian in origin as such blades are characteristic of the Clovis Culture (Collins 1999). However, they are more likely associated with the proposed middle-late Holocene technology. More work is necessary in order to confirm their origin, as well as the existence of the two proposed Holocene-era microblade industries. To the south, a late Holocene microblade industry was present in southern California, and is much better understood there (cf. Dietler 2003; Heizer and Kelley 1962; O’Neil 1984; Pitzer et al. 1974; Swartz 1959, 1960). Among the Chumash of the Channel Islands, microblades were made for use as drills for shell beads (Dietler 2003). Other rubbing rock occurrences have been identified elsewhere in North America. 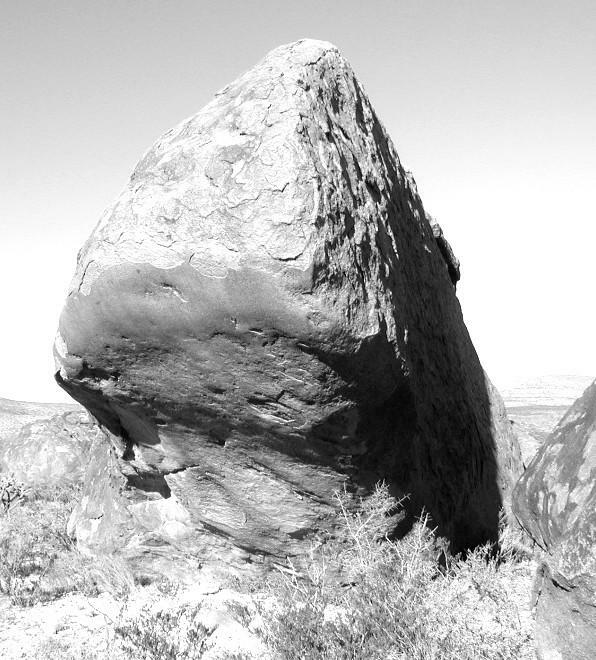 In the Southwest, LeRoy Unglaub and Ekkehart Molatki have documented rubbing rocks at Cornudas Mountain, Alamo Mountain, Providence Cone, and Akela Flat in New Mexico. They have also found them at Hueco Tanks in Texas. The Hueco Tanks and Cornudas Mountain sites were first proposed as rubbing rock occurrences in the 1940s (Lang 1941, 1947). Kirk Peterson and Bruce Miller discovered two rubbing rock sites on the former shoreline of Lake Lahontan in northwestern Nevada (Peterson 2002). In Minnesota, Kevin Callahan has recorded an ancient buffalo rubbing rock at the famous Jeffers Petroglyph site. Other buffalo rubbing rocks are known throughout the Great Plains. (19) In Wisconsin, Dr. Stephen Dutch (Dept. of Geology, University of Wisconsin, Green Bay) has identified a likely rubbing rock at Rock Springs near the Baraboo River. In 2003, Dr. Dutch visited the Sonoma Coast sites so as to better evaluate the site at Rock Springs. Other notable visitors to the Sonoma Coast sites in the past year or two include Dr. Gary Haynes of the University of Nevada, Reno, and Dr. Tim Flannery, Director of the South Australian Museum. Drs. Haynes and Flannery are both accomplished scholars of the Pleistocene (e.g., Flannery 1994, 2001; Haynes 1991, 2002). Additionally, Dr. Christopher Chippendale of Cambridge University visited the Mammoth Rocks site as did a large tour group from the 2003 International Quaternary Association (INQUA) conference in Reno, led by Dr. Carol Prentice of the U.S. Geological Survey.Closer to home, Gary Shannon of California State Parks discovered a rubbing rock in the coastal range overlooking the Mammoth Rocks site. The new site is located on the side of Red Hill at an elevation of 207 m. The site consists of a blueschist boulder about 2.5 m in height. It occupies a bench that may possibly (albeit unlikely) correlate to Quaternary Marine Terrace 1 (QMT1). QMT1 (estimated to be about 516,000 CALYRBP) has not been mapped in this area, but is known further south near Bodega Bay. In that area, it is found significantly lower at approximately 79 m elevation. The difference in elevation could conceivably be a matter of accelerated uplift as one moves north. 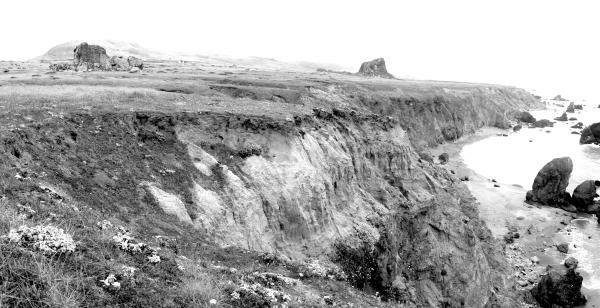 For example, on the southern Mendocino Coast, the oldest uplifted terraces are located at about 300 m and date to 420,000 CALYRBP (Prentice 1989:133). QMT2 (73 m elevation and 472,000 CALYRBP) and QMT3 (61 m and 320,000 CALYRBP) have also been mapped in the Bodega Bay area. QMT4 (52 m elevation and 320,000 CALYRBP) is visible cut into the hillside just above Mammoth Rocks. Mammoth Rocks and Jasper Rock, at approximately 40 m elevation, are both on QMT5 which is thought to correlate with the 5e (125,000 CALYRBP) sea level high stand (Hitchcock and Kelson 1998:23, 28). The Red Hill site is interesting because of its higher elevation and association with what may be a much older uplifted terrace. The polished surface of the Red Hill boulder measures about 1 m square and is almost completely covered with lichen. Lichens have been slow to colonize the polished surfaces of the lower rubbing rocks at Mammoth Rocks and Jasper Rock. The fact that the polished surface at Red Hill is almost completely obliterated from view by lichen growth suggests that the rubbing rock has gone unused for a much greater period of time than have the rocks further below on QMT5. During summer 2004, I am again working with a volunteer crew in the 4x4 m exposure at Jasper Rock. The exposure is being expanded in order to make it safe enough to continue the deeper excavation. Tom Origer’s fall 2004 fieldclass will return to the site, and by the end of this year, we hope to have a better idea of what is to be found in the deeper depths of the site. However, given the difficulty and depth of the excavation, we may not have many answers until next year. Also in summer 2004, Jack Meyer of Sonoma State University excavated a column sample from the 4x4 m exposure at Jasper Rock. The excavated sample will be subjected to flotation analysis. As part of this same project, we hope to obtain a radiocarbon date from soil in the lower cultural component (i.e., from the lowest layer of the site that we know to be cultural). Meyer will also conduct flotation analysis of a column sample I excavated at Mammoth Rocks in fall 2002. At Mammoth Rocks, I excavated a single 1x1 m control unit adjacent to a heavily-polished rock face. In my excavation, I encountered a 0-48 cm dark brown topsoil (Rohnerville Loam) overlying a compacted yellow loam subsoil. I recovered several chert flakes in the 0-20 cm levels, and quite a few more in the 45-70 cm levels. The chert flakes in the subsoil appear to have come from CA-SON-1713, a green chert source (with evidence of quarrying) located about 250 m north of Mammoth Rocks. The chert flakes found in the topsoil were brown and gray in color, and came from elsewhere in the area.Drs. Marvin Rowe and Karen Steelman of the Department of Chemistry, Texas A&M University, have agreed to use their plasma-chemical extraction (PCE) method in an attempt to date samples of the polished rocks by direct AMS radiocarbon measurement (Rowe 2001; Rowe and Steelman 2002). They have had great success in the past at extracting and dating organic carbon from pictographs using the PCE method, and may be able to apply it to the polished rock samples with the same results. They will work with samples from both Jasper Rock and Mammoth Rocks. Included among California’s most precious natural resources are the state’s vernal pools, seasonally flooded depressions found on ancient Ice Age soils with an impermeable layer such as a hardpan or claypan. The origin of the pools has always been a bit of a mystery, and there are several theories that have been offered to explain them. During earlier times, these features in the Central Valley were often referred to perhaps derisively as “hogwallows” just as similar features were referred to as “buffalo wallows” on the Great Plains (Anonymous 1998:15). I have recently added a new theory to the mix. In 2003, I hypothesized an association between vernal pools and ancient Rancholabrean wallows (Parkman 2003b). 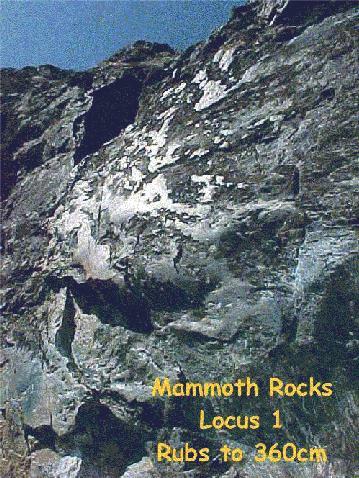 My reasoning began with an observation at Mammoth Rocks in 2001. (20) The site contains an unusual wetland depression which measures about 0.5 ha in size. 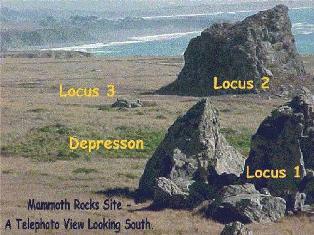 The depression is encircled by four loci of polished rocks. As unlikely as it may seem, I believe the depression may be a relic wallow left over from the late Pleistocene. If that is the case, then its presence helps explain the rubbing rocks that encircle it. Contemporary rubbing rocks are typically associated with the bathing and grooming behavior of megafauna. For example, African elephants wallow at waterholes in order to coat themselves in mud, then, as the mud dries, they rub it off against a hard object, often a large boulder. This helps remove extoparasites from the animal’s skin. Bison often use dry wallows for a similar purpose. I suspect that Ice Age mammoth and bison had similar practices to their modern-day counterparts. If so, then it seems probable that some of California’s vernal pools began as animal wallows. In the case of those that did not, it seems likely that they served as useful waterholes in late spring and early summer, and would have thus been affected by the very presence of the megafauna (e.g., African elephants are known to enlarge and “improve” waterholes). California’s vernal pools are typically associated with late Pleistocene soils and landforms (Anonymous 1998:18; Holland 2000:31-32; Stone 1990:91). While some of the Pleistocene pools have undoubtedly filled in over time, it is likely that many of these depressions have survived through the ages. The use of the vernal pools by megafauna during the late Pleistocene would have maintained many of the pools’ depressions until the time of the megafauna’s extinction, perhaps as late as 10,000 CALYRBP. The repeated use of the wallows by the megafauna would have prevented the California flora from colonizing the depressions for any length of time. However, upon the demise of the megafauna, and for the past ten millennia, the plants would have been free to move in and colonize the abandoned wallows. It is likely that plant adaptations and ecological dynamics mitigated against the in filling of many of the pools. Thus, if my hypothesis is accurate, many of California’s vernal pools were born of abandoned wallows at the dawn of the Holocene. I am currently exploring how best to investigate this aspect of the Rancholabrean Hypothesis. The discovery of the Sonoma Coast rubbing rocks has inspired a multidisplinary effort to better illuminate the natural and cultural histories that characterized the San Francisco Bay area at the end of the last Ice Age. In order to truly understand the rubbing rocks, it is first necessary to fit them into the Pleistocene landscape. That means reconstructing major game trails, calculating optimal carrying capacities, estimating numeric predator-prey relationships, and integrating interrelated plant and animal communities, among other things. By creating this paleoenvironmental model, the rubbing rocks become features of an integrated landscape rather than anomalous stand-alone sites. To date, the scientific testing of the model has been one of divergence. In the lab, SEM and AFM analyses have resulted in evidence that appears to validate the rubbing rock interpretation. It remains to be seen whether future lab analyses, such as the AMS radiocarbon dating of the rock polish, the flotation of soil samples, or some future probing for ancient DNA will bring additional positive results.However, contrary to the positive results derived from the lab analyses, the field investigations have diverged from the original course. To date, the excavations at Mammoth Rocks and Jasper Rock have revealed little if any tangible subsurface evidence of the Rancholabrean megafauna’s presence; they have instead revealed evidence of a human presence that may have considerable antiquity. While we continue to pursue mammoth and bison in the lab, we are chasing microblades and hammerstones in the field. If we are lucky, the megafauna and artifacts will come together in the lower levels of the Jasper Rock excavation. At least, that is what the model suggests may happen. And if this does not happen at Jasper Rock, perhaps it will at Mammoth Rocks. The Scientific Method requires that a working hypothesis be rigorously tested, and done in such a way that any and all results can be quantified and replicated. However, the Scientific Method does not require that the hypothesis be confirmed. If a test is structured properly, science advances regardless of whether the hypothesis is confirmed or denied. Either way, things are learned in the process. Too many scientists, including many of the archaeologists I know, remain quiet rather than risk being proven wrong. In the end, that attitude limits our scientific knowledge.The model that I am constructing to accompany the Rancholabrean Hypothesis may eventually be denied. But regardless, I believe that something useful will be learned in the process. On the other hand, should the model be confirmed, we may have another tool for helping locate the evidence left behind by the area’s first pioneers. I believe that is worth the risk of being proven wrong. I wish to thank the many colleagues and volunteers who have assisted me with this project in recent years. I especially thank Tom Origer of Santa Rosa Junior College for the assistance of his archaeological fieldclasses; John Foster and Jan Wooley of California State Parks for facilitating my recent grant from the State’s Cultural Stewardship Program; Glen Halverson, Elmer Kurtec, Diana Breslich, and Gail Hillesheim, the most valiant of my volunteer excavators; Steve Norwick, Rolfe Erickson, and Tim McKernan of Sonoma State University for their assistance in the University’s SEM Lab; and to Stephen Edwards, Gary Haynes, Roberta Jewett, Kent Lightfoot, Michael Kennedy, Jack Meyer, Heather Price, Marvin Rowe, LeRoy Unglaub, and Greg White for their ongoing assistance and advice. To these individuals, and the many others who have helped me, I am most grateful. 1 Raj Naidu accompanied me in the discovery of the Mammoth Rocks site on September 12, 2001. Brendan O’Neil, an Associate Resource Ecologist with California State Parks, led me to the Jasper Rock site several weeks later. 2 Although the alternative explanations offered to explain the polished rocks have been all but ruled out, my “rubbing rock” interpretation still remains a working hypothesis and should not be considered a proven fact. 3 It is possible albeit unlikely that some of these blocks were felled by natural processes such as seismic events. 4 During the 1989 excavation at the Duncans Landing Rockshelter, I saw what I believed to be scant evidence of a possible cultural component below Component 1. Unfortunately, recovery conditions were very difficult given the great depth and small size of the unit, and the fact that we encountered the suspect component at the close of the project. A small sample of soil was recovered from beneath Component 1, wet-washed using very fine mesh screen, and the screenings analyzed under a microscope by Rae Schwaderer, Thomas Wake, and me. No cultural evidence of any kind was recovered in this manner. However, in spite of this absence, I still believe that there is at least one unidentified cultural component lying below Component 1. The hypothetical component, if real, is almost certainly Paleoindian in origin. Actually, it would be surprising if the earliest inhabitants of the Sonoma Coast did not make use of this rockshelter, given its exceptional size and strategic location. 5 The deep excavation unit is sited immediately adjacent to the quarried boulder and in an area where large blocks of the outcrop were knocked or pried off (see Fig. 2). Most of the quarry debris found here is comprised of various-sized pieces of rough percussive shatter, rather than the debitage resulting from stone tool making activities. However, more flakes were recovered in the excavation units sited further away from this area. 6 At the time of the last glacial maximum (ca. 19,000-15,000 CALYRBP), sea level was about 120 m lower than today, thus the exposed coastal plain extended all the way to or near the edge of the continental shelf, and included the Farallon Islands. At that time, Lighthouse Peak on South Farallon Island stood 241 m above the coastal plain, and the Cordell Bank was itself a considerable promontory as well. The edge of the continental shelf, known as the “Farallon Escarpment,” is found at a depth of 100-150 m in the San Francisco Bay area (Chin and Graymer 2001:27). In recent studies of the sea floor of the shelf, areas of relict sediment (deposits of mostly sand and gravel left on the shelf when it was exposed during times of lower sea level) have been mapped (Karl 2001:90). These old deposits may hold the key to the location of submerged Paleoindian sites. 7 If you factor in California’s Central Valley, which I have not done in this study, the ecosystem becomes even larger than the Serengeti-Mara system. It is likely that some bison herds and others moved from the Central Valley west through the Carquinez Strait and the Golden Gate to the coastal plain and back. 8 Evapotranspiration rates should have varied significantly enough between the coast and interior to make the coastal prairie attractive to the local megafauna in summer months. The animals would have also visited the coast for salt and other essential minerals. 9 The rocks are located at approximately 37° 50’ N, 122° 27’ W.
10 Because these three pinnacles were perceived to be potential navigational hazards, the United State Geological Survey developed plans to remove the upper portions of each rock and place the debris in nearby bayfloor depressions (Chin et al. 1998). 11 Using comparative data from the Serengeti Plains of East Africa, the Arctic National Wildlife Refuge in Alaska, and the historic American Great Plains, and assuming a grassland environment for the Franciscan Valley and Farallon Plain, I calculate an optimum Rancholabrean predator-prey relationship for local grassland and grassland-savanna areas at approximately 1/140 (Parkman 2003a). If correct, there would have been one large predator (e.g., sabertooth cat, California lion, dire wolf, American short face bear, etc.) for every 140 megaherbivores (e.g., horse, camel, bison, mastodon, mammoth, etc.). Furthermore, my calculations suggest that in the most optimum conditions, there may have been one megaherbivore per 4 ha. Obviously, these are speculative numbers that cannot be confirmed or denied. However, they do allow a sense of the ecological dynamics of the Rancholabrean landscape. 12 The Mammoth Rocks site likely commanded a similar position on the Rancholabrean landscape. Like the rocks of the Alcatraz Triangle, it would have offered large predators and Paleoindian hunters-scavengers an ideal cover for monitoring and ambushing prey. 13 The preliminary analysis of fossil conifers from Bodega Head indicates that the coastal prairie was bordered by a closed-cone coniferous forest at approximately 50,000 CALYRBP, during the time of the Port Talbot Interstadial. Pinus radiata and P. muricata predominated at that time. The location and composition of the forest at 11,000 CALYRBP are thought to have been similar (Simons et al. 1985:265-266). 14 At 13,000 CALYRBP, the Duncans Landing Rockshelter had a 5-m high opening facing the ocean, and a similar one facing the hills (the rockshelter is derived from an ancient surge channel cut through the rock). Both openings would have been easily visible from a considerable distance. 15 CA-NAP-58 is a large occupation site situated on Ritchey Creek just 4 km from the Napa Glass Mountain obsidian source. To date, all work conducted at CA-NAP-58 has consisted of surface survey. The tremendous amount of obsidian waste material littering the site’s surface suggests that it served as a workshop. The majority of the waste was derived from a core and flake industry. Among the waste are blade-like flakes associated with the initial reduction of raw material, as outer surfaces were “peeled” from the inner core. While resembling blades in the most generic sense (i.e., having parallel sides and a length more than twice that of the width), these flakes are not true blades and are easily distinguished from the true blades (or microblades) also found at the site. As a test, I have sampled collections from CA-SON-29, the Annadel Obsidian Quarry, to verify the distinction between blade-like flakes and true blades in a workshop setting. 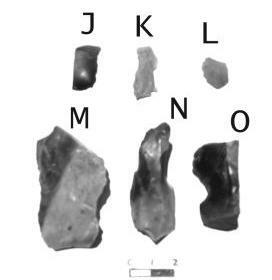 Also present at CA-NAP-58 are examples of bifaces made on blades or blade-like flakes. What are lacking, however, are blade cores. While a few microblade cores have been found at CA-NAP-58 and at a few sites on Ritchey Creek and in Lake County, their relative paucity makes my proposed microblade technology extremely problematic. Thus, for the time being, my proposals regarding both microblade technologies should be viewed with extreme caution. More work is needed by trained lithic specialists to confirm the presence of such technologies. 16 Heizer (1953:264, 341) identified two types of blade-like tools at CA-NAP-1. Type A1 (n=11) were “long, narrow blade-like obsidian flakes” ranging from 40-80 mm in length, with retouch around the edge or along both long sides. Type B1 (n=6) were “blade-like obsidian flakes with one long side unretouched to form a back.” They ranged from 30-90 mm in length and had retouch along one long side. 17 Not to be confused with the current “Lakeside County Park” near Kelseyville. 18 The backed bladelets from Jasper Rock and Duncans Landing Rockshelter are unlike the typical microblades found on the Northwest Coast. Nor do they resemble the microblades I have seen in the Transbaikal region of Siberia and elsewhere in North Asia. This may be a reflection of the small sample size from the Sonoma Coast (n<10), but more likely these tools represents a different technology and purpose. The Sonoma Coast specimens have relatively low length-width ratios and are characterized by steep edge angles. They may not represent microblades in the truest sense but are perhaps best described as utilized blade-like flakes. 19 In 1993, I saw numerous buffalo rubbing rocks and wallows while assisting Dr. Jack Steinbring of the University of Winnipeg with a multi-province rock art assessment on the Canadian Plains. During that time, I worked with Lawrence Tobacco, a distinguished Northern Cree elder, who was interested in the relationship of the rocks to the former buffalo-hunting cultures of the Plains. 20 An earlier observation came in 1988 as I flew across the Laotian Plain of Jars in Southeast Asia. On the ground below, I could see many thousands of bomb craters delineating the former Ho Chi Minh Trail, which the North Vietnamese once used to resupply their war efforts in South Vietnam during what the locals call the “American War.” What was striking about the craters was the fact that they were filled with water, just like California’s vernal pools after the winter rains. Over time, plants and animals have adapted to the craters, and they are now a part of the local ecology. Indeed, local farmers often use them for growing fish. If plants can adapt to bomb craters in Southeast Asia, they should have adapted similarly to abandoned wallows in California. The fact that wetland plants have colonized abandoned bedrock mortars (Holland 2000:28) and tire ruts (Bauder et al. 1997:15) in California’s Central Valley, thus making miniature or linear vernal pools of them, seems proof enough that wallows would have been colonized by such plants in earlier times. 1998 Jepson Prairie Preserve Handbook. Jepson Prairie Docent Program, 2nd edition. Solano County Farmlands and Open Space Foundation. 1997 Vernal Pools of Southern California. Report prepared for the U.S. Fish and Wildlife Service, Region 1, Portland, Oregon. 1979 The Wappo: A Report. Malki Museum Press. 2001 The Topper Site: Beyond Clovis at Allendale. Mammoth Trumpet 16(4). Corvallis, Oregon: Center for the Study of the First Americans. Edward Ueber, Peter H. Stauffer, and James W. Hendley II, eds., pp. 21-36. United State Geological Survey, Reston, Virginia. 1999 Clovis Blade Technology. Austin: University of Texas Press. 1999 Bones, Boats, & Bison. Albuquerque: The University of New Mexico Press. 1991 Observations on the Prehistory and Ecology of Grazing in California. Fremontia 2091):3-11. 1987 A Fluted Projectile Point Fragment from the Southern California Coast: Chronology and Context at CA-SBa-1951. Journal of California and Great Basin Anthropology 9(1):120-128. 1979 Routes: Alternative Migration Corridors for Early Man in North America. American Antiquity 44:55-69. 1994 The Future Eaters: An Ecological History of the Australasian Lands and People. New York: Grove Press. 2001 The Eternal Frontier: An Ecological History of North America and Its People. New York: Grove Press. 1948 An Ancient Site at Borax Lake, California. Southwest Museum Papers 16:1-126. Los Angeles. 1991 Mammoths, Mastodonts, & Elephants: Biology, Behavior, and the Fossil Record. 2002 The Early Settlement of North America: The Clovis Era. Cambridge: Cambridge University Press. 1953 Archaeology of the Napa Region, University of California Anthropological Records 12(6). 1962 Burins and Bladelets in the Cessac Collection from Santa Cruz Island, California. Proceedings of the American Philosophical Society 106(2):94-105. 1998 Assessment of Seismogenic Sources between the Rodgers Creek and San Andreas Faults, Northwestern San Francisco Bay Region, Sonoma County, California. Report prepared by William Lettis & Associates, Walnut Creek, California. 2000 The Flying M Ranch: Soils, Plants, and Vernal Pools in Eastern Merced County. Fremontia 27(4) and 28(1):28-37. Special Issue: Vernal Pools. 1979 Geologic History of Middle California. University of California Press. 1988 Late Pleistocene Large Mammalian Herbivores: Implications for Early Human Hunting Patterns in Southern California. Bulletin of the Southern California Academy of Sciences 87(3):89-103. 1989 Seasonal Migration of Bison antiquus from Rancho La Brea, California. Quaternary Research 31:107-112. 2002 Very Old News from the Channel Islands: Interdisplinary Research at Arlington Springs. Paper presented at the 67th Annual Meeting of the Society for American Archaeology, March 20-24, Denver. Jones, Terry L., Richard T. Fitzgerald, Douglas J. Kennett, Charles H. Miksicek, John L. Fagan, John Sharp, and Jon M. Erlandson 2002 The Cross Creek Site (CA-SLO-1797) and Its Implications for New World Colonization. American Antiquity 67(2):213-230. 2001 Sediment of the Sea Floor. In: Beyond the Golden Gate - Oceanography, Geology, Biology, and Environmental Issues in the Gulf of the Farallones, Herman A. Karl, John L. Chin, Edward Ueber, Peter H. Stauffer, and James W. Hendley II, eds., pp. 90-100. United State Geological Survey, Reston, Virginia. 1941 Polished Areas on Granitic Porphyries of the Hueco and Cornudas Mountains of Texas and New Mexico. Science (New Series), Vol. 94, No. 2443 (24 October 1941), pp. 390-391. 1947 The Polished Rocks of Cornudas Mountain, New Mexico. Science (New Series), Vol. 105, No. 2716 (17 January 1947), p. 65. Meighan, Clement W., and C.V. Haynes, Jr.
1970 The Borax Lake Site Revisited. Science 167(3922):1213-1221. 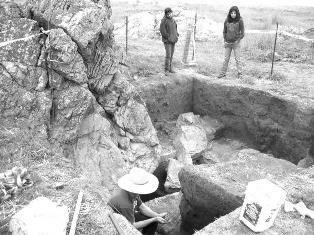 1988 An Archaeological Investigation of CA-LAK-589, Anderson Marsh State Historic Park, Lake County, California. Santa Rosa: California State Parks. 1984 Late Prehistoric Microblade Manufacture in San Diego County, California. Journal of California and Great Basin Anthropology 6(2):217-224. 2002a Rancholabrean Rubbing Rocks on California’s North Coast. Report on file at California State Parks, Sonoma. 2002b Mammoth Rocks: Where Pleistocene Giants Got a Good Rub? 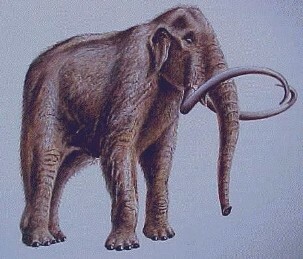 Mammoth Trumpet 18(1):4-7, 20. College Station, Texas: Center for the Study of the First Americans. 2002c Evidence of Rancholabrean Rubbing Rocks on California’s North Coast. Society for California Archaeology Newsletter36(4):26-31. 2003a An Hypothesis Regarding the Paleoecology of the Late Pleistocene San Francisco Bay Region. Unpublished manuscript in author’s possession. 2003b A Conversation with Mark A. Walters Regarding the John Walters Memorial Collection. Report on file at California State Parks, Sonoma. n.d. Extremely High Polish on the Rocks of Uplifted Sea Stacks along the North Coast of Sonoma County, California, USA. Quaternary Research. In press. 2002 Preliminary Investigation of an Anomalous Polished Outcrop in the Edna Mountains, Nevada. Unpublished manuscript in author’s possession. 1974 Microblade technology of the Channel Islands. Masterkey 48(4):124-135. 1989 Earthquake Geology of the Northern San Andreas Fault near Point Arena, California. Unpublished doctoral dissertation, California Institute of Technology, Pasadena. 2001 Dating by AMS Radiocarbon Analysis. In: Handbook of Rock Art Research, David S. Whitley, ed., pp. 139-166. 2002 Radiocarbon Dating of Rock Paintings Using Plasma-Chemical Extraction. American Laboratory, September, pp. 15-19. 1983 An Archaeological and Ethnohistorical Study of Bale Grist Mill State Historic Park, Napa County, California. Sacramento: California State Parks. 1992 Archaeological Test Excavation at the Duncans Point Cave, CA-SON-348/H. In: Essays on the Prehistory of Maritime California, Terry L. Jones, ed., pp. 55-71. Center for Archaeological Research at Davis. 1985 A Fluted Point from the Mendocino County Coast, California. Journal of California and Great Basin Anthropology 7(2):260-269. 1990 California’s Endemic Vernal Pool Plants: Some Factors Influencing their Rarity and Endangerment. In: Vernal Pool Plants: Their Habits and Biology, Diane H. Ikeda and Robert A Schlising, eds., pp. 89-107. Studies from the Herbarium, California State University, Chico, Number 8. 2003 Simulating Coastal Migration in New World Colonization. Current Anthropology 44(4):580-591. 1959 Microblade Manufacture in the Santa Barbara Channel Region. Archaeological Survey Annual Report 1958-1959, pp. 95-103. University of California, Los Angeles. 1960 Blade Manufacture in Southern California. American Antiquity 25(3):405-407. 1982 Temporal and Spatial Distribution of Concave Base Projectile Points from the North Coast Ranges, California. Journal of California and Great Basin Anthropology 4(2):67-79.